Castell d’en Planes Pavilion in Vic has been witness of the good level of the Show artistic skating modality, with a full attendance of the public and excellent quality of the presented works of all participant clubs. Oscar Molins, Isabel Repullo, Carles Gasset, Alicia Rodero. Parets Artistic Skating Club. 2nd place. Almost 600 skaters met on 18th and 19th to compete for an opportunity to be in Catalonia Championship and to have a place in the podium. It has been a very competitive championship where participants have given emotion to the public. This Barcelona Championship edition had created high expectation for the Artistic Skating Club of Parets del Vallès participation; which is formed by its coachers and Alicia Rodero, all of them retired skaters of the individual competition. Their performance left no one indifferent but didn’t get the gold; however, they covered the expectations obtaining the second place. 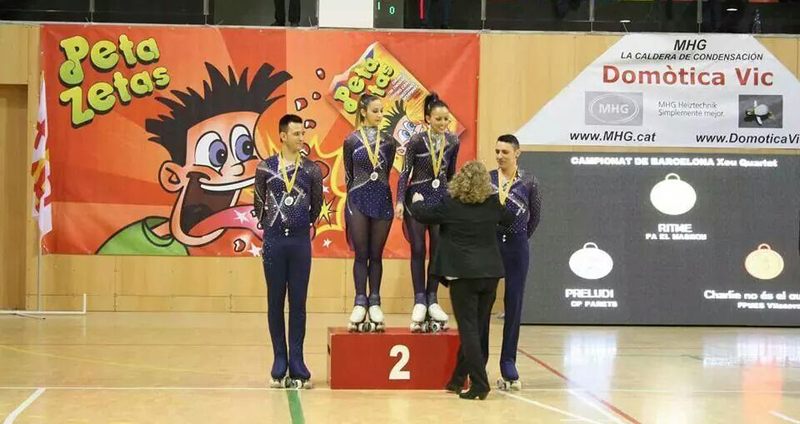 The star was the Artistic Skating Club of Masnou for winning three first places of four categories. All of them with a high level thanks to technical team lead by Jaume Pons and Anna Domènech. ADULTS SHOWS: 1º P.A. EL MASNOU, 2º C.E. MALGRATENC P.A. 3º C.P.A. RODA DE TER. KIDS SHOWS: 1º C.P.A. SANT CELONI. 2º FPUEB VILANOVA. 3º C.P.A. RIPOLLET. YOUTH SHOWS: 1º P.A. MASNOU. 2º C.P.A. TONA. 3º C.P. SANTA EUGENIA DE BERGA. QUARTETS SHOWS: 1º P.A. EL MASNOU. C.P. PARETS. 3º FPUEB VILANOVA. Zeta Espacial congratulates all participants, because all have worked together as a team giving fun to all the public. Peta Zetas® is proud for cooperating in this event organized by Osona Skating Club.